Think Budweiser, and you’re thinking of the United States of America at its most clichéd - jocks and cheerleaders, cinnamon apple pie, Tony Stark and the Superbowl. But of course, although Bud is uniquely American, it has its roots in the German brewing tradition. In fact, eight out of the ten best-selling beers in America have German origins. And, yep, they’re all lagers - half of them “light” varieties. 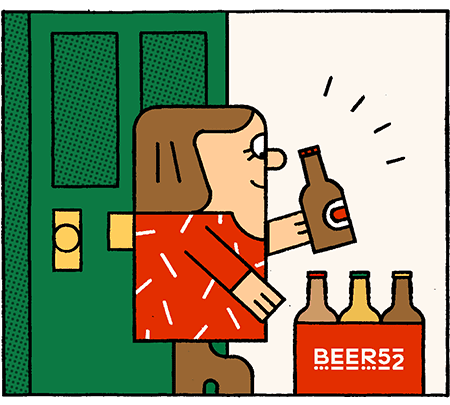 How did a singular style of beer come to dominate the American market, and why is it so different to its continental European forefather? Beer School takes a leisurely, two-part look into how the great American lager came to be, why, and where it’s going. Let’s be frank. Commercial American lager is bland. There is little variety in the top ten best-selling lagers because they are all brewed in very similar ways with very similar ingredients. But it wasn’t always this way. Once upon a time, America had the tiswin corn beer drunk by the Apache, or the choc beer of the Choctaws of Oklahoma, brewed with tobacco as well as hops and barley. See also spruce beer, sour porter and coriander ale, the Kentucky Common and the Pennsylvania swankey, which sounds worth drinking just because of the name. Generally, these beers were made in small batches with top-fermenting yeast, sold locally and drunk quickly, before the beer soured. Bottom-fermenting lager was introduced to the USA just before 1840, much later in history than the more robust porters and stouts from Britain that could be shipped over warm without spoiling; lager imports had to wait until the technology of refrigeration developed. Couldn’t Americans just brew their own lager before then? No, since bottom-fermenting yeast was to be found only in Europe, and the journey by boat was just too long for the special fungus to survive the transatlantic crossing until the mid-1830s. Historians disagree exactly who successfully brought over the first viable yeast, but one candidate is John Wagner, a Bavarian immigrant and brewmaster who brought a sample from Germany to Philadelphia for making his own lager. True to the old tradition of sharing yeasts, Wagner is said to have given some of his to a fellow local brewer, George Manger, who opened a commercial brewery, producing lager in much bigger quantities than his friend. This was to huge success - local German populations were booming thanks to the huge numbers of people who were being displaced by anti-aristocracy revolts in Europe and choosing to emigrate to the New World. One million Germans moved to the USA in the second half of the 1800s, carrying with them a pride for their own brewing traditions, and they lapped up this reminder of home. Many other breweries followed in brewing bottom-fermenting lager, possibly even using the same sample of shared yeast. According to an account that is likely apocryphal, the breweries often ran out and had to post adverts proclaiming when the next batch would be ready for sale. In 1846, a brewery in Boston was making lager, another in New York that same year, and one in Chicago the next. Lager had legs. By 1860, lager represented one-fourth of US beer production (about 1.1 million hl of 4.5 million hl). Why was lager proving to be so popular, not only within the German communities but outside of them too? Well, imagine that all your life, you’ve only ever slept under a rough, slightly scratchy blanket. It’s thick, warm and kinda dense, but it does the job. Then, one day, someone gives you a new-generation super-engineered duvet, all fluffy and light, that warms you up from the inside but keeps you refreshingly cool at night. That would have been the difference between drinking the new lager and the beers of yesteryear. Germans also brought over beer garden culture to America, open drinking resorts that catered to families (meaning, heaven forfend, you might find a woman there – some Irish pubs didn’t allow women until at least the 1960s). Rather than somewhere to drown your sorrows in a puddle of whiskey, German beer gardens were for whiling away a Sunday afternoon, getting pleasantly tipsy but not inebriated. They were often attached to the new breweries and ennobled German lager as a safer, more acceptable option for alcohol in a society where the temperance movements were increasingly powerful. Another key factor in spreading the popularity of lager outside the German community was the Civil War of 1861-1865. German-Americans made up the largest single ethnic group in the North’s army, with over 200,000 German natives serving alongside Americans who might yet to have had their first sip of light, bright lager. The war also mixed together country boys with city boys, introducing rural soldiers to the city delights of lager, particularly when soldiers passed through or were stationed near cities where there were lager breweries. Washington, for example, was surrounded by sixty Union forts and full of hospitals for wounded troops. It was also home to several lager breweries and no doubt many thousands of young men from the countryside first tasted lager made by Ernst Loeffler, George Juenemann, or John Kozel. It’s important to note that despite all the German names and origins, this was not German beer. It was distinctly American beer, made in America from American ingredients for both practical and economic reasons, since shipping over barley and hops from Europe would have been costly and inefficient. This had a major impact that defines American lager to this day. Whereas Bavarian barley was of the two-row variety, the barley in America was six-row, high in protein and therefore prone to haze during lagering to create harsher flavours than its gentler cousin. American hops at the time were likewise coarser in flavour. The new German brewers needed something to temper these abrasive features, and that something was not only right in front of them, but all around: corn. Corn was and is a huge crop in America and, as per the tiswin corn beer and many others, it had a history with brewing. The new German brewers found that this native corn softened their beer, lending it a distinct sweetness, smoothing out the edges of the American barley. It also contributed little haze, producing a clearer beer. By cleverly combining imported German aroma hops with domestic bittering hops, a fraction of corn with the domestic barley, these brewers could make a flavourful Pilsener-style beer, similar to the lagers of central Europe, but very much of the USA. By the 1870s, new technology helped to cement lager as the alcoholic beverage of choice in a land used to hard liquor. Artificial refrigeration became economically viable, critical for allowing lager production to increase in scale to meet demand. Refrigerated train cars allowed the bigger breweries to market their products country-wide and ensured a consistent product. Between 1840 and 1875, the amount of beer consumed per person per year rose from one to just over six gallons. The looming threat of temperance actually helped lager. From 1830 to 1845, the movement gained momentum as increasing numbers of Americans took voluntary “temperance pledges” to give up the perennially popular spirits and cider of their homeland. German brewers brought over a European outlook towards beer – that it was a life-stuff, natural, nourishing, and above all, relatively harmless. Lager’s clear and light nature underlined this sentiment and, for a while, it passed muster as a temperance beverage. But as sentiments towards prohibition hardened in the 1870s, beer had to become weaker and once again the originally German drink had to evolve into something more of its new home; mellower still, less alcoholic, and thanks to the refrigerator, more stable. As an 1878 issue of the trade publication Western Brewer noted, Americans “want a clear beer of light color, mild and not too bitter taste.” This was the Bohemian pilsner and, against the darker lagers, it won out with those who sought to avoid the judgement of the puritanical abstainers. It also suited the American factory worker, who would often eat and drink at saloons between shifts. No one wanted to risk coming back to work drunk, so the lighter beers were the best bet. In 1876, Anheuser-Busch introduced Budweiser, whose rice adjuncts produced an even milder beer, to great success. Around the same time, Pabst Blue Ribbon, with its corn adjuncts, became a national sensation as well. By the time Prohibition finally rolled into town in 1920, American lager had established itself as very distinct from the flavoursome Bavarian lager that it came from. With as much as 25% corn in its mash bill, it was sweet, with a medium malt flavour, aroma and body and medium to high bitterness. 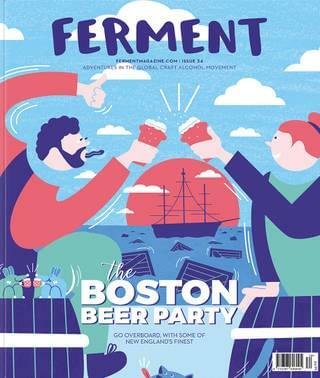 In the second part of this article, next issue, we will explore the permanent effect that Prohibition had on the American palate and how this impacted on the lager that Americans had grown to know and love. We will also explore the phenomenon of “light” beer, asking how and why it has become the number one choice for many drinking Americans. Watch this space.